Last year was a big one for our family business. For those of you who dine at Tempo Perso regularly, you will probably know me (Marco) but you might not know about our restaurant in Italy – Osteria del Tempo Perso Casalvieri, now run by my mum and my brother. That’s where it began more than 15 years ago and it was our shared success that inspired us to open a true Italian eatery in Edinburgh and prompted my move. I now call Scotland’s Capital home. We have tried different things during our time occupying the corner of Bruntsfield Place. There have been business partnerships that have come and gone but 2018 marked the year that I chose to make a change. I chose to return to my roots. I chose to rebrand the business. I chose to focus on simple, delicious plates of Italian food inspired my childhood and my love of seasonal produce. 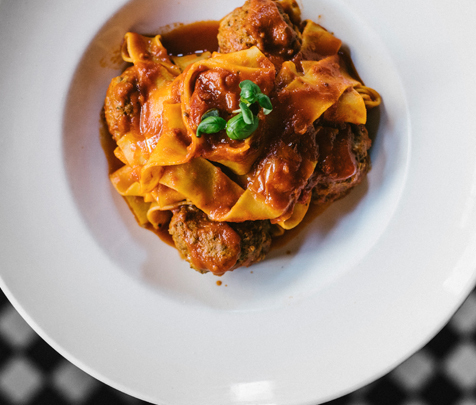 We became the Tempo Perso – the independent Italian Eatery and Wine Bar you know and love. Tempo Perso was officially born in May 2018, when months of preparation came to life in the form of our new signage, new menus and a new mission; to educate people about real Italian food as I know and experience it…fresh pasta, the perfect mix of Italian and local produce, carbonara without cream, good coffee, no pizza! And at the heart of what we do, my life passion – wine – it is a fundamental aspect of our mission. After all, homemade meatballs with a fabulous wine is Italy on a table. With a focus on food quality, building a community of regular customers (who know we care) and with a fabulous team around me and behind me, we had a record-breaking year. We had an award-winning year. Runners up in the Scottish Italian Awards ‘Best Wine Selection’ category and winner of SCOTLAND’S BEST ITALIAN AUTHENTIC MENU. No mean feat and actually, we were one of very few Edinburgh winners in The Italian Awards 2018. Needless to say, it was a proud moment for us. Especially as our customers were responsible for us becoming finalists in the first place. I’m pausing for reflection and I’m offering thanks in February because it’s the month of love. We put love and passion into our work and our food every day so it seemed a fitting time. In typical Tempo Perso fashion, we’re not doing a set Valentines’ menu today. We are doing what we always do. We are creating delicious daily specials so you can spoil yourself or the one you love over great food and great wine. At Tempo Perso we’re proud to have shared many great times with our lovely, loyal customers and we look forward to many more.